If you're old enough to remember door-to-door deliveries — of milk, eggs, fish, bread, potato chips, you name it — you may also recall the reliable little delivery van that brought those goods to your family's door. In most instances, it was a DIVCO Delivery Truck. For ubiquitous dairy deliveries, it might have been driven by one of the many faithful milk delivery men who started their routes about 3 AM and filled their orders by placing glass milk bottles into the square metal milk box left on front porches — ready for that first cup of coffee or bowl of cereal for the kids. 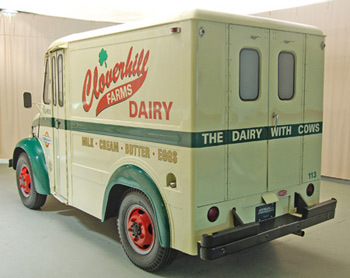 In the 50s about 80% of milk sales came from home deliveries and a DIVCO was the iconic home delivery van. George M. Bacon was the engineer behind the DIVCO. In 1904 he got his start in the automotive industry, joining Columbus Buggy Co. where tire giant Harvey S. Firestone had worked a decade earlier. Three years later Bacon left the company to partner with carriage maker William C. Anderson who recapitalized the Anderson Carriage Co. to position it to build electric cars. As production grew, eventually reaching nearly 30,000 units, the company became the Detroit Electric Car Company, producers of the most famous early American electric car powered by the Elwell-Parker motor/controller, an efficient system for battery electric propulsion. Clever businessmen, Bacon and Anderson added a false hood and radiator to these cars to make them look like more widely-accepted gasoline-powered vehicles. By the twenties, though, sales were down a bit and there was a shift from passenger to commercial vehicle production. In 1922 Bacon designed an electric milk truck with some great features. It had a front-hinged door so the driver could step in and out easily and it could be driven from four positions: front, rear, or either side running board. Still, there were some problems. Electric motors couldn't adequately power the vehicle and Detroit Electric didn't want to switch to gasoline power. So, in 1924, Bacon resigned from Detroit Electric, found some investors, and started the Detroit Industrial Vehicle Company (DIVCO) to build a more powerful gasoline-powered truck. He tested a prototype in 1924 powered by a LeRoi gasoline engine, quickly followed by another test in 1925 with the Detroit Creamery using 25 of those models. In 1926 DIVCO was ready to begin mass producing its Model A milk trucks with a 4-cylinder Continental engine and Warner 4-speed transmission. Multi-stop deliveries gave the vehicle a real workout, requiring that multiple components be developed from scratch, including heavier brakes, clutches, transmissions, higher output generators, etc. needed to withstand numerous stops and starts as well as long idle times. This "extra" work drained capital and by the time of the Great Depression, the company was faltering. In 1931 a creditors committee took it over and auctioned it, with its engine supplier Continental Motors entering the winning bid. Continental later divested and merged it with Twin Coach Co. (1936). A complete redesign in the late thirties, the DIVCO-Twin Model U brought a welded all-steel body, an attractive streamlined front end which some claim resembles the Airflow Chrysler, and a snub-nosed hood complete with an art deco-style hood ornament. Below the hood ornament was the DIVCO name plate and below that the divided, built-in grille with more than a dozen grille slats. Exterior grab bars on both sides of the van were available to assist the driver who entered and exited the van multiple times a day. 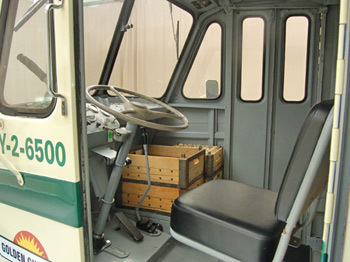 The driver could swing the seat forward, allowing for seated or standing operation. Warner Gear devised a control system wherein a single pedal served as both clutch and brake. To disengage the clutch the driver pushed the pedal halfway down and re-engaged the clutch by releasing the pedal. To brake the driver pushed the pedal to the floor. In most of these vans the throttle was a rotary knob situated on the end of the shift lever. It controlled the 4-speed manual transmission. The divided front windshield provided plenty of visibility as did the driver's side windows. There were two small, elongated windows in the side, semi-automatic folding doors and in the rear double door. Milk crates were loaded into the back of the truck and the vans were specially painted with the colors and logos of the dairies who owned them. This basic design proved enormously popular and remained in production until 1986. Only the basic design of the VW beetle had a longer run. While earlier designs depended upon block ice and salt for refrigeration (leading to floors rusting from the inside out), in 1940 the first insulated and refrigerated unit came out. Only in 1954 were refrigerated vans offered as a regular production option, though. During WWII production ceased so the plant could be used to produce aircraft parts and other needed war materials but got a special OK from the federal government to restart production in December, 1944, months ahead of other car manufacturers. The postwar years were good ones for DIVCO with annual sales overtaking prewar sales considerably at nearly 7000 units sold a year. 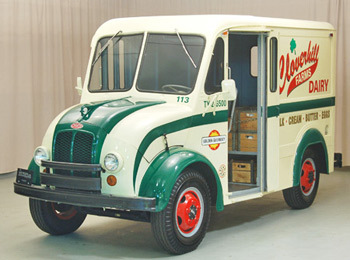 The postwar vans came in two wheelbases: the Model UM had a 100-3/4 -inch wheelbase good for making tight turns and the Model ULM (intended for wholesale milk use) a 127-inch wheelbase. Gross vehicle weight (GVW) were 9,000 and 12,000 pounds, respectively, and engines were 4-clinder or 6-cylinder Continentals. For the smaller vans powered by a 140 cubic inch, 4-cylinder Continental engine, top speed (wait for it!) was 46 mph. DIVCO vans were slow, awkward, and shook a lot but they were durable and reliable, not to mention cute. Photos courtesy of Hyman Classic Cars; used with permission.